An aura of mystery surrounds Saffron (Crocus sativus), both the bulbous plant and the spice derived from its luminous red stigma. In actuality planting the corm and raising a few saffron plants to produce a small supply of the spice is easy, fun and rewarding. One of the simplest ways to provide the right conditions for healthy saffron and assure a certain amount of control over light, moisture and nutrient requirements is simply to plant in pots. Using pots allows the grower to make sure these drought-tolerant sun-lovers experience perfect drainage, are protected from burrowing critters, and remain in easy access to be sure the flowers are not missed! To plant Saffron bulbs in a pot: Use a 3-gallon-size plastic or ceramic pot, placed solidly on the workbench, filled up to 3 inches from the rim with the potting mix. I like to use 1/3 organic compost, 1/3 clay soil and 1/3 coarse, sharp sand as my special Saffron potting mix, but honestly any good quality fast-draining potting soil will do. If the soil is dry and/or fluffy, make sure to moisten it slightly beforehand and tamp it down before setting your bulbs on it. Lay the bulbs out with base of the corm down and shoots pointing straight up. 6 corms fit nicely in a 3-gallon pot, giving the plants plenty of room to grow. Space the bulbs out evenly and then cover over with more of the same potting soil, filling the pot up to the brim and tamping firmly to finish. Label the pot with the identity of the contents (Saffron!) and the planting date. 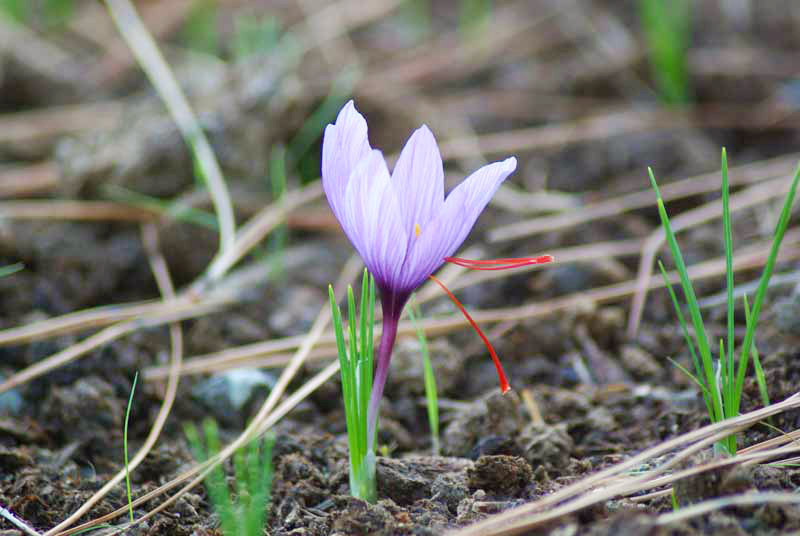 How to care for Saffron: First, understand the life cycle. In the fall, after the corms are planted, they send up pointed dark-green shoots and the strongest plants also make flowers. Flowers occur from September to November. The plant remains in leaf from fall all the way through to April, which is when it goes dormant once again. During the growing season, the primary corm will increase in size and is also likely to produce a ring of fertile cormlets. During summer dormancy, the bulbs may be dug up, separated to make more plants, and replanted in fresh soil. Good drainage and a warm, sunny exposure are necessary prerequisites to success with saffron. The plants like to be protected from freezing and watered relatively frequently during their growth period. Summer dormancy should be warm and dry. Emergence and flowering occurs simultaneously in the fall of the year, and at this time relatively dry conditions are favorable. If you’re growing in pots, place the pots in a full-sun position, protect from heavy rain, and water very occasionally. How to harvest and cure Saffron: Saffron plants produce up to 4 flowers each in their prime, and each flower produces a lolling 3-pronged tongue of vivid orange stigma and style. Wait until the afternoon of the (hopefully) sunny day when the flower opens completely. Folks speak of using a tweezers to pluck the stigma and style out at the base, but I prefer to use my fingers, which is more personal and tactile. I drop the pilfered jewels into a little white ceramic saucer. Each stretchy strand of Holy Saffron is precious–I want to keep my eye on it! And, I never engage in the borderline sacrilegious practice of plucking the whole flower and dissecting it later. The little bowl of saffron is brought indoors and left in the shade to cure, which takes a few days. The strands shrivel and intensify in color and aroma. At this point they may be placed in a stoppered glass vial stored in a cool, shady cupboard. How to use Saffron: I associate the unmistakable sweet fragrance of Saffron with holy temples I have visited. The spice cleanses the soul and uplifts the spirit. Only a very tiny amount need be used–the spice is concentrated. A couple of strands of saffron thrown into the rice pot while it finishes cooking will completely transform plain white rice into ambrosia. Too much can be overpowering. Saffron is also used in herbal medicine, a flavoring agent which masks the odor and taste of obnoxious herbs, an analgesic and antiseptic for teething infants, a sedative for nervous disorders, an antispasmodic for painful periods or digestive woes. A few strands of saffron may be added to warm milk or water, covered and allowed to steep for a few minutes, then taken in tiny sips. Thank you for all you do for the earth! I have a homestead in Northern New Mexico, elevation 7500′, Born and raised there, I know a lot about what is edible & medicinal in my forest. We have Burdock growing around a lot of our creeks and rivers, but I would love to have my own patch close to the house. If I plant your seeds, will it pollinate with the Burdock growing in the wild and create a different plant and or result? Thanks again! No, the wild burdock is a different species (Arctium minus) and won’t hybridize with the larger-rooted domestic gobo. Hello Richo, I just bought some saffron that is waiting in my cousins house in NY. They will be planted in the higlands of Ecuador in early december. I asked my cousin to store saffron inside his refrigerator… until I can bring them to my country in early december. We dont get any snow here. Is that ok? Any suggestions? Can the saffron become a cash crop? How long does it take to start up and harvest enough to sell? I ordered bulbs from you a few months ago when you posted on Instagram and harvested the first saffron strands yesterday. It was such a surprise and joy to see the flower! Thanks for your blog and IG posts!! Hey Richo — love this blog. Here in upstate New York (not only cold but often wet and cloudy), Zone 5 or 4b even, is it possible to grow indoors? Read an article from University of VT Ag Dept about experiments there growing saffron outside in low tunnels. Mst plants including saffron don’t really like to grow indoors. In general plants need at least 6 hous of sunlight per day to be truly happy. In your situation, I would suggest ceramic pots on the patio, oriented south, under the eaves so no rain hits them. No, the timing is perfect.